Published: April 26, 2018 at 08:16 p.m. Updated: June 1, 2018 at 08:23 p.m.
At long last, we have our answer. Cleveland's twisting, twirling and wholly unpredictable path toward the first-overall pick in the 2018 NFL Draft reached its final destination Thursday night with the selection of quarterback Baker Mayfield. The Browns then elected not to trade out of the No. 4 pick -- as many speculated -- choosing instead to pick Ohio State cornerback Denzel Ward. Erasing months of speculation that USC's Sam Darnold or Wyoming's Josh Allen would land at No. 1, Browns general manager John Dorsey opted for Mayfield, the Oklahoma signal-caller who doubles as the draft's most-accurate passer. Mayfield has been dinged by some for his 6-foot-1 stature, but the Heisman Trophy winner finished his college career as the most efficient arm in NCAA history, sporting a titanic passer rating of 131.1 to go along with a 69.8 completion percentage over 40 appearances as a Sooner. "Mayfield might lack ideal size, but I love his accuracy, playmaking skills and toughness," wrote former pro scout and current NFL Media draft analyst Daniel Jeremiah. "He has the tools to be a quality NFL starting quarterback early in his career." If Darnold is viewed as the safer option, Mayfield gives Dorsey and the Browns an electric performer who draws praise for his on-field fire, savvy and skill set -- but also concerns from some about his maturity. "Guys have his back. He's a little bit obnoxious but he's very high energy," one NFL scout told longtime beat writer Bob McGinn of BobMcGinnFootball.com. "If he's on the other team you [bleep] hate him. If he's on your team you love him." 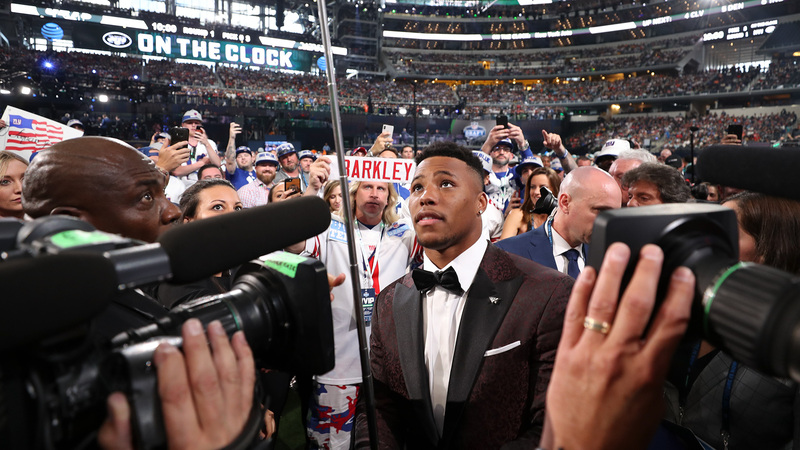 Dorsey must feel comfortable with Mayfield's overall makeup, confidently telling ESPN's Josina Anderson prior to the draft: "If you have certain blemishes on your track record, I want to meet you face-to-face. I want to see what lies within your soul and I'll find out within 15 minutes if you have a soul or not!" Winding up in Cleveland, Mayfield will now be asked to make good on his promise to turn this long-suffering organization into a club that goes punch-for-punch with the Steelers, Bengals and Ravens in the AFC North. "If it's anybody's going to turn around that franchise, it'd be me. To be able to put them in the right direction," Mayfield said of the Browns at the Scouting Combine. "They're close. They have the right pieces. Just need one guy at quarterback to make that difference." The Browns kept this decision under wraps until the end, with Mayfield's name emerging in the eleventh hour after weeks of chatter suggesting Darnold or Allen would wind up in Cleveland. In Cleveland, Mayfield will be given time to grow behind veteran Tyrod Taylor. Browns coach Hue Jackson has already named Taylor, the former Bills starter, as the team's No. 1 quarterback. These pre-draft promises often become dust, but the Browns are under no pressure to shove Mayfield into the fire. Instead, they can grow him behind the scenes and help him adjust to life in a pro-style offense. "He's been a guy who's played at a high level, an all-star level, as a collegian," NFL Network's Bucky Brooks recently said on the Move the Sticks Podcast. "And the things that come to mind when I watch Baker Mayfield: feisty, gritty, tough, alpha-dog competitor, a guy who is accurate and decisive with the ball and, more importantly, he's a winner. He's a guy who's played on big stages and come through and delivered for his team." Said Jeremiah: "I'll start with just how quick he is. Everything's quick in the pocket. Quick feet. He's got a nice, quick stroke. He can make every throw. Arm-talent-wise ... getting a chance to see him live for the first time, whatever concerns you may have had -- "OK, he's a smaller guy, can he really spin it?" -- this dude can spin it. I mean, you see him throw with velocity, he can drive the ball outside the hash." Dorsey has been lashed by some as a meat-and-potatoes FOOTBALL GUY destined to pivot the franchise away from the analytics-based approach previously embraced by jettisoned VP of football operations Sashi Brown. The choice of Mayfield, though, suggests otherwise. The former Oklahoma star recorded the second-highest AIQ -- Athletic Intelligence Quotient -- among of 63 quarterbacks since 2012, per The MMQB's Robert Klemko. Analytics nerve-center Pro Football Focus also tabbed Mayfield as the draft's top passer, writing: "From a pure production standpoint, Mayfield has been in another class, and he has the necessary NFL tools despite questions about his height. He owns the two top PFF grades since 2014 and he possesses the arm, accuracy and playmaking ability to be the best quarterback in the class." PFF credited Mayfield with the "lowest percentage of negatively graded throws in the nation for two straight years," while leading the NCAA in "big-time throw percentage" in 2018. For all the handwringing, it's fair to wonder if Dorsey and Sashi Brown would have ultimately selected the same quarterback on Thursday night. Beyond the front office, pressure now falls on Jackson to finally flip the switch on a team with one lonely win over the past two seasons. Jackson overtly complained about the lack of veteran talent under Brown's watch, an issue Dorsey addressed right away this offseason during the team's aggressive free-agency rampage. Whether its Taylor or Mayfield under center for the Browns in 2018, Cleveland's surrounding cast is beginning to take shape. Beyond a deep quarterback room, the Browns house a cast of skill-position players lead by Josh Gordon, Jarvis Landry and Corey Coleman at wideout; David Njoku at tight end; and Carlos Hyde and Duke Johnson in the backfield. The offensive line is one of the better on paper, even after the loss of iconic left tackle Joe Thomas. Jackson has plenty of young talent to work with, starting with a pair of exciting and talented quarterbacks. Taylor for today; Mayfield for tomorrow. If Dorsey's plan clicks, the Browns -- a team mired in pitch-black darkness since 1999 -- have the chance to roll as a watchable, intriguing outfit come September.